“Pope in France: 'Latin Mass an act of tolerance.’” It’s not my title. It was the headline of a recent article by John L. Allen Jr., reporter/commentator of the progressivist National Catholic Reporter who covered the Pope’s recent four-day visit to France. I quote it because it summarizes quite well, in my view, the present day status of Traditionalists after the momentous 2007 ruling that gave broader permission for the Latin Mass to be said. Benedict responded: “Their fear is unfounded, for this Motu Proprio is merely an act of tolerance, with a pastoral aim, for those people who were brought up with this liturgy, who love it, are familiar with it and want to live with this liturgy” (emphasis added). The allowable deviation from a standard. Either way, to be “tolerated” hardly seems to me cause for victory rallies. Perhaps that is why the conservative circles were so quiet about this significant remark which clearly shows Benedict XVI is far from being the hero fighting to impose the Tridentine Mass everywhere. He only permitted it, as he expressly stated, for “pastoral aims,” which can well translate to this: to keep the assorted conservative and traditionalist groups happy and insert them into the “communion” of the Conciliar Church. No opposition between the two liturgies? The message is quite clear. 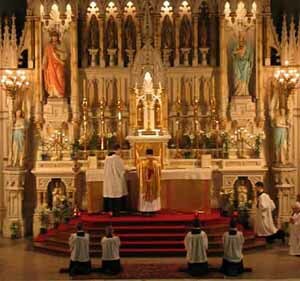 To be admitted into communion with progressivist Rome, conservative and traditionalist Catholics must admit there is no opposition or contradiction between the Tridentine Mass and the New Mass. This is precisely the point that those in resistance to the changes in the liturgy would like to publicly discuss with the Vatican: Both a contradiction and an opposition do indeed exist between the so-called “renewed” liturgy and the Tridentine Mass. We assert that there has been not only a desacralization, but also very grave doctrinal changes that were made in this act of divine worship. Now, we are told the die is cast, that there can be no discussion. Conservatives and traditionalists may have an occasional Tridentine Mass, but they must put aside all their doctrinal objections to the new liturgy, which was written by a commission that included six Protestants and was headed by ultra-progressivist Fr. Anibale Bugnini. They must forget about the abolition of the sacrificial character of the Mass, its Protestant emphasis on a memorial supper and the weight given to the participation of the so-called priesthood of the faithful, along with many other points of contention. These and other doctrinal problems have been carefully and respectfully presented in the declaration of resistance, We Resist You to the Face. What we Catholics who have taken up the position of resistance want is more than an “act of tolerance.” We would like to see a public discussion – a dialogue, if you like – with the Vatican on the serious points of contradiction and opposition that we see in post-Conciliar initiatives, including that of the liturgical reform. If the Pope and the Vatican would have an authentic “pastoral concern” and were really concerned about the truth, they would enter into a public debate, responding directly to these doubts of the faithful. But instead, “pastoral concern” for the Pope and the Vatican means allowing the Mass as an “act of tolerance” to keep them all silent. Polite requests for discussion have been dismissed or ignored. Benedict certainly seems to be following the same policy of refusing any discussion on the topic. Permission to say the Tridentine Mass, often greeted as the first step of a grand return to the past, ends as a mere maneuver to silence an inopportune opposition. Nothing but another progressivist trick to fool well-intentioned Catholics. The French saying comes to mind: “The more things change, the more they remain the same" (plus cela change, plus c’est la même chose). 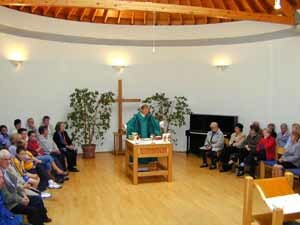 Will the coming hybrid Mass look like this Anglican service? In the past year, there has been a lot of confusion about how much of the New Mass will have to be adopted by the Tridentine rite. We have read that the new lectionary can be imposed on the Tridentine Mass, that readings can be made in the vernacular, that the Novus Ordo observance of Holy Days of Obligation can be imposed on the old calendar, or that the “dialogue Mass” in Latin is compulsory. The first possibly implies that traditionalists will soon have to invoke Blessed John XXIII, Blessed Rosmini, Blessed Teresa of Calcutta and Blessed Newman in their Masses. And what does “a greater emphasis on common participation” mean if not certain adaptations, such as the dialogue Mass, holding hands at the chanting (in Latin) of the Our Pater, lay people reading the Epistles, and so on? 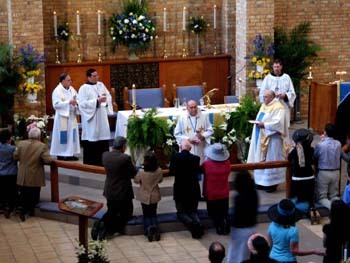 I don’t believe that many Novus Ordo Masses will be touched by this “enrichment process,” but it seems to me a sure bet that the Tridentine Mass will be forced into gradual adaptations, should traditionalists and conservatives agree to travel along the road to a hybrid Mass. 1. 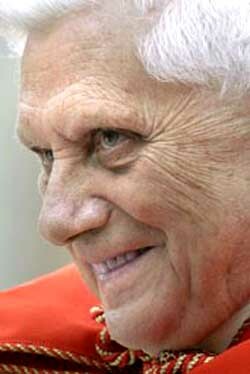 Quotes from the interview of Benedict XVI on the papal plane , September 12, 2008 posted on the Vatican website.